“When I started teaching piano on the new Traditional Music degree course, it was to Ronald I went, week in and week out in the early years of the course, to discuss, ask advice, and always, get more ideas, more musical examples, and even more importantly, he made me feel that it was possible to create a piano course which would incorporate as many aspects of pianism from every genre and yet, would be faithful to the Traditional Music ethos as well. In the conservatoire, I needed a room with two pianos, in order to be able to demonstrate, as one would do if one were teaching fiddle. Ronald gave me great encouragement in the early days, to insist on this requirement. He could see that it was an essential element in the way traditional music should be taught. 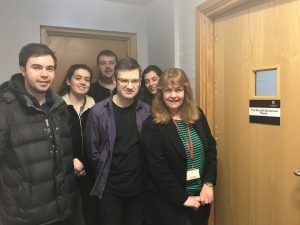 From the start, I realised that it would be invaluable for my first-study students to go down to Ronald’s house in West Linton and to experience this unique world of his. I have also, to include his wife Marjorie in this, because they both shared his musical vision and this encapsulated a world-view of music, with no comparisons, only respect for all traditions and all humanity”. Read the full piece of writing here. Pictured are Mary, James Ross (her first student on the RCS traditional piano course, who now teaches alongside Mary), as well as the current cohort of traditional piano students. "This website is about the music I play and love and the passion I have for preserving and sharing traditional music with those who may otherwise never come across it, be it Balkan, Peruvian, Irish, Scottish or from elsewhere in the world. You can hear samples of my CDs and buy the two books of piano transcriptions comprising the whole Molaidh Uist CD." Mary McCarthy is a pianist, accordionist and celebrated Suzuki piano tutor. She directs Suzuki teacher training courses in Scotland, Ireland and South America.